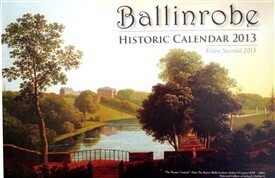 The Ballinrobe Historic 2013 calendar/planner/diary was launched with both English and Irish headings at Heritage Day in Ballinrobe recently. Would you like to give the gift of ‘time’ to your family, friends or business partners for birthdays, anniversaries, special events or even Christmas and the New Year? "My family in America loves getting a copy"
"With very few free calendars available now I appreciate it at such a good price and all printed and produced in Mayo too"
By purchasing a calendar or two you are supporting us in bringing Ballinrobe to the international stage, promoting tourism, creating and producing more Heritage Walk leaflets and maintaining this website. All the work is voluntary too, with no middle-men eating into our scarce resources. Cost is €6.00 euro per copy with a special price of €20.00 euro for four copies. Post for single copy world-wide is €3.00 and for multiple copies by request. We would like to extend a very big Thank You to all our advertisers, without whose help this publication would not have be possible. We appreciate their support very much.